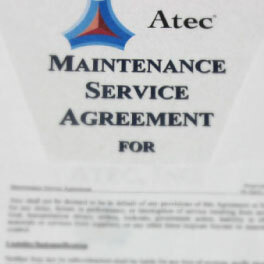 An Atec Service Agreement involves regularly scheduled visits for routine review and maintenance, as well as defined provisions for unscheduled on-site services, as needed. Every visit includes an evaluation of equipment, as well as inspection, cleaning, troubleshooting system issues, repairing systems and components, and replacement, as required. Our technicians and FSRs are a call or email away, and our 10 worldwide locations could have them onsite in hours. Customers wishing to have a more planned approach to maintenance assistance from Atec Companies should talk to us about Scheduled Maintenance programs or even state of the art Condition Based or Prescriptive Maintenance programs. Our Data Acquisition expertise can match your requirements to Trending and Predictive Analysis that can yield savings from Just In Time Servicing while suggesting the fix and reducing unexpected failure downtime. Atec’s 50+ Test Cell SMEs have the knowledge to develop and operate the Maintenance Program you need. Personnel training is often included in the MSAs/GSAs provided by Atec to ensure proper use and upkeep of the systems we maintain. Atec can also provide an expert, third party review of conditions and processes, and work per client direction to assist any needed improvements. In addition to the on-site services provided by an Atec MSA/GSA, our On-Call Digital Technical Support is also made available to our clients (and equipment personnel) by phone, email, or Skype Monday-Friday, 8 am-5 pm CST. Our On-Call Digital Technical Support puts our engineers and experts in your ear or at your fingertips to answer questions and offer assistance, whenever possible, by phone or video communication. On-Call Technical Support often eliminates the need for unexpected site visits and provides immediate support in crucial moments. Our 24/7 Emergency Hotline is now legendary in our industry worldwide. Emergency On-Site services can be added to any MSA/GSA with quick turn-around time to get your equipment back up and running. Choosing to include Emergency Services in your custom fit MSA/GSA guarantees that your equipment is backed by the Atec team at its best—and at its worst. Atec can also respond to our clients on a purchase order/tech order basis, when an MSA/GSA is not active. Our IDIQ with the USAF involves test cell sustainment worldwide to very demanding technical and logistical requirements. New international locations in Singapore, Dubai, Istanbul and London are pacing our growth in onsite commercial and military sustainment. The Atec MSA/GSA is subject to limitations by contract. If you are interested in an MSA/GSA to bolster sustainment for your facilities, equipment or project, please Contact Us.